Very Good. 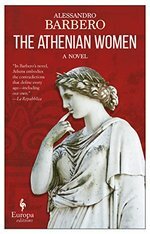 The Athenian Women: A Novel by Barbero, Alessandro, 2018-01-02. Trade paperback (US). Glued binding. 256 p.
Good. The Athenian Women: A Novel by Barbero, Alessandro, 2018-01-02. Trade paperback (US). Glued binding. 256 p.